With any installation of Mac OS X comes Emacs (Extensible, customizable, self-documenting real-time display editor – yes that’s what EMACS stands for, now you know!) and with Emacs, some easter eggs that let you play some good old 70’s games directly at the command line. Yes really, there are retro video games embedded in your text editor! Here is how you can play them. To play tetris simply use the arrow keys and the spacebar. As for pong, it is a two player game (or a contest of your left hand versus your right). Player one uses Left/Right (or 4/6) and Player Two uses Up/Down (or 2/8). Me personally, I’m partial to snake and tetris, but have fun! Thank you to Carl Gravel for the tip! 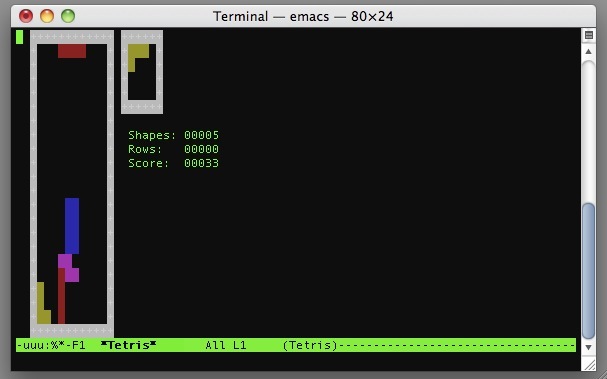 I haven’t seen this command to get to Tetris Easter egg before! Much faster and easier to remember!